As we were still aboard the "Helen H," approaching Hyannis after a super successful pelagic on July 19th, our cell phones lit up with email and text alerts that had stacked up throughout the day while we were at sea. Among those emails was one from New Jersey with news of a European Golden Plover that had been identified just that day. Doug had prior family obligations in Massachusetts for the 20th, so he was unable to chase the bird. But Tom and I were ready to drop everything and run. The only problem was...we were so wrecked and sleep deprived that there was no way we could safely reach anywhere near New Jersey without first catching some sleep. As Tom suggested, "We ride at dawn." And that's what we did...or maybe a bit after dawn. Either way, we heard that the bird was still there on the 20th but had flown around 9am. Still, our hopes were cautiously high that it could be relocated, especially since it had flown in the same direction the day before only to reappear at the original location early this morning. And yet we arrived to a line of birders looking at an empty field. We spent a good few hours branching out in all directions, hoping to refind the bird in a different field. We searched long and hard til dark, intermittently returning to the group of birders at the original location, without luck. 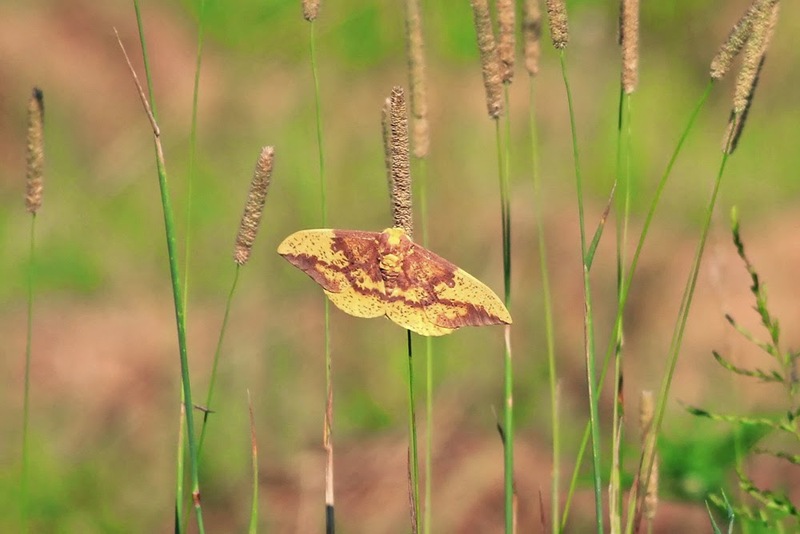 Our only consolation prize was this large Imperial Moth. We thought it was worth another shot on the morning of the 21st, so we arrived at the field pretty darn early and waited for a couple more hours. After nearly 24 hours since the last sighting we chose to throw in the towel and return to Connecticut to reconvene with Doug and officially start our trip south. (FYI, the plover was never seen again). 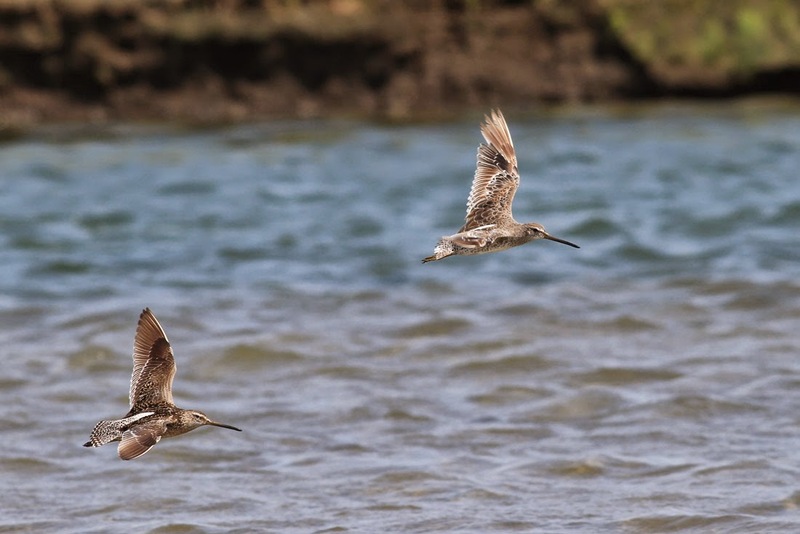 Later that day the three of us met Julian Hough at Milford Point in Milford, CT, where Semipalmated Sandpipers had arrived in force. Here we had a conservative count of 2,500 birds and were able to scour most of them unsuccessfully for any Old World relatives. This site has three accepted records of Red-necked Stint, last in 2006, so I figured the place was due for another...but not on this day. We crashed in Brooklyn that night and planned on shorebirding Long Island on the 22nd. We focused our efforts during the first part of the day on Cupsogue Beach County Park & vicinity, where we tallied a nice list of shorebirds including a few "Western" Willets, a Whimbrel, and a sweet adult Western Sandpiper. Terns were a bit less diverse than they often are here, but still included a Royal Tern despite the complete lack of Roseates. We ended the day with a visit to the East Pond at Jamaica Bay, a shorebird mecca with a fantastic track record of rarities. However, the water levels were just beginning to drop and very little mud likely kept shorebirds from settling at that location. We had nothing of note and very few individuals to look at. It pretty much sucked. Doug was devastated. Night in Brooklyn. Our plan for the 23rd was to drive to Bombay Hook in Delaware and continue birding the refuges southward from there with no firm schedule. I had only birded Bombay Hook once before, and never during peak shorebird season, so I was looking forward to this place. It did not disappoint. The muddy pools were covered in migrant shorebirds. Some of our counts included 290 American Avocet, 22 Stilt Sandpiper, over 3000 Short-billed Dowitchers and four Long-billed Dowitchers. Prime Hook was slow so we didn't spend much time here and proceeded south to Figgs Landing in Maryland. Here were two roadside pools with lots of potential for drawing in migrant shorebirds, waders, and terns. A flyby flock of 9 Whimbrel was a highlight here. For our last stop of the day we set up an evening watch at nearby Truitts Landing, also in Maryland. We spent two hours standing around and counting birds migrating and heading to roost. 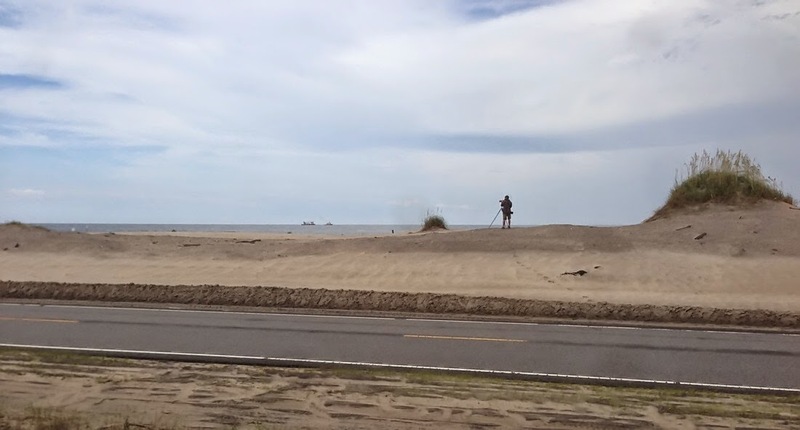 Among other things we had our first Solitary and Pectoral Sandpipers of the week, a flyby calling Long-billed Dowitcher, 1,090 Laughing Gulls, and 14 Seaside Sparrows. Night somewhere nearby. The only thing we had to worry about on the 24th was arriving in Hatteras, NC at a reasonable time in the evening. So we planned on hitting Chincoteague NWR and Pea Island NWR en route. We ended up running into some dodgy weather at Chincoteague so our birding here was cut short a bit, but we still managed to sample the best spots. Here we enjoyed six heron/egret species, many Marbled Godwits and "Western" Willets, and eight species of tern/skimmer. 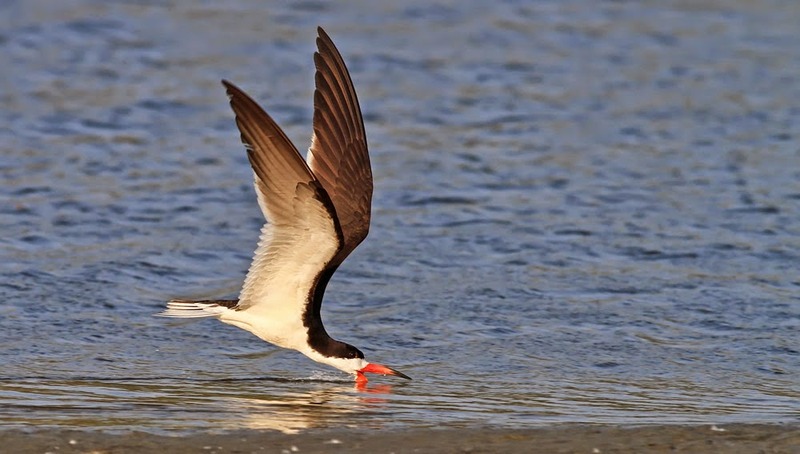 Check out our eBird checklist if you'd like. 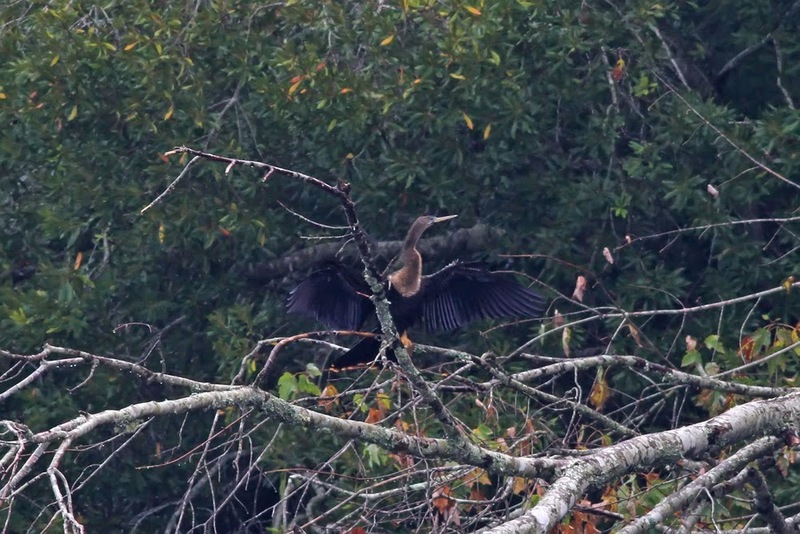 Before we reached the Outer Banks, Tom had keyed into a very cool nesting event that we were interested in checking out - breeding Anhingas in Chesapeake County, Virginia. Not far off our track, we found the spot quite easily and immediately got on the birds. 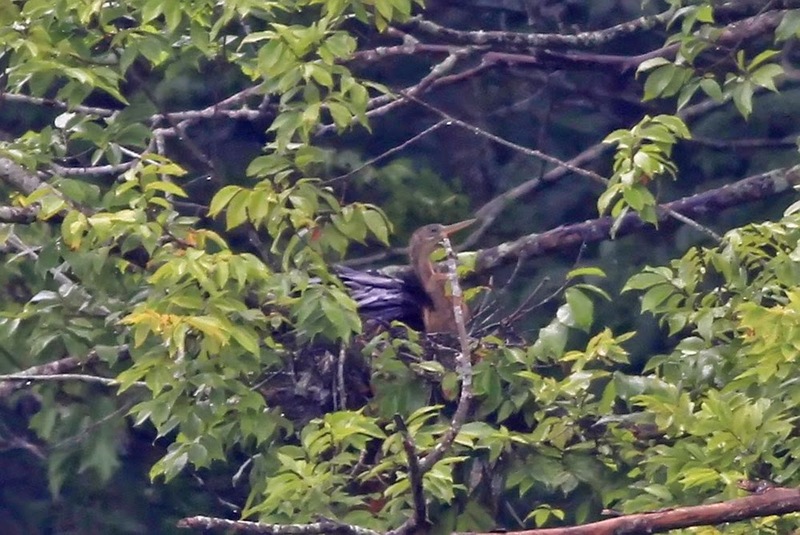 There is one known active nest, but the presence of a second female bird raises the possibility there may be other nests there or nearby. The numbers and variety at Pea Island were not exceptional, and we arrived in the Hatteras area earlier than expected for a good night's sleep. The 25th and 26th were spent offshore with great success - see the blog post for details and photos! When we woke up in Hatteras on the 27th our road trip was just about over, but we still had the drive back home! Actually, Brian had hoped to run a third consecutive pelagic on the 27th, but lack of subscription kept us from going out. Since we had an extra day on land to play with, we split our return drive into two days, retracing our steps. As we headed back up the Outer Banks we ticked Eurasian Collared Dove. Pea Island was again underwhelming so we continued to Chincoteague, where we finally found something rare on land! A solitary WHITE-FACED IBIS was the only Plegadis ibis in sight. Retracing our steps, we stopped again at Figgs Landing and again were impressed with the place, where we tallied 31 Stilt Sandpipers. We ended the day at a spot we had not yet visited - Ocean City, Maryland where we scoped a Skimmer Island from Route 50 at sunset. The volume of birds at this tiny piece of habitat was impressive! 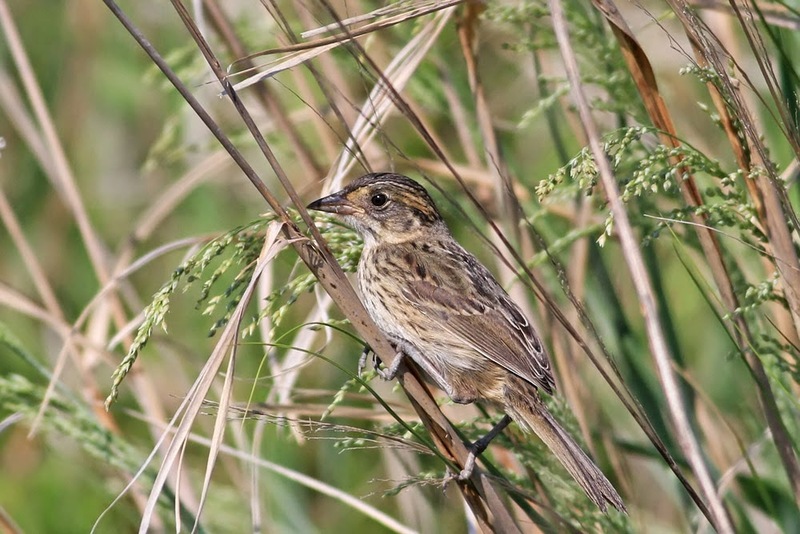 See our eBird checklist for details. Night near Rehoboth Beach, Delaware after a cold beer at Dogfish Head Brewery. Our last day, the 28th, was spent revisiting the Delaware hotspots. 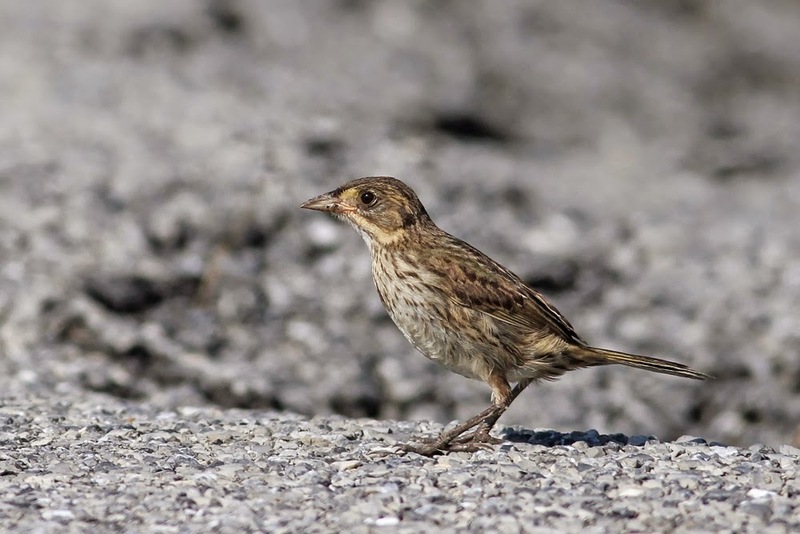 Our highlight at Prime Hook was a photo session with several Seaside Sparrows, mostly juvs. Bombay Hook again impressed with sheer numbers alone. For example, 339 Avocet, 525 Semipalmated Plover, 350 Lesser Yellowlegs, 70 Stilt Sandpiper, 8,000 Semipalmated Sandpiper, 4,000 Short-billed Dowitcher, and a few less common species such as four more Long-billed Dowitchers and a Pectoral Sandpiper. From there we all went our separate ways, concluding a great week of birding. This was exactly what I needed to get back into the local birding scene, from which I had been slowly drifting away for the past couple of years. It felt great to shake off some rust and spend a week birding the East Coast with these awesome guys and birders!